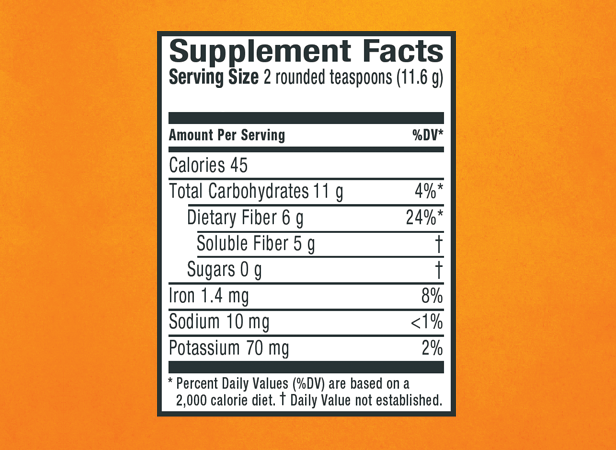 Meta Appetite Control, from the makers of Metamucil—the #1 doctor-recommended fiber brand—is great-tasting and will help you feel less hungry between meals* Available in sugar-free Orange Zest. Psyllium is a natural fiber ingredient originating from Plantago ovata. The psyllium in Meta Appetite Control works by forming a gel in your digestive system, which aids in the sensation of fullness. PHENYLKETONURICS: CONTAINS PHENYLALANINE, 25 mg per teaspoon. Store at room temperature tightly closed to protect from humidity. Keep out of reach of children. Directions: ADULTS 12 YRS AND OVER. Put two rounded teaspoons into an empty glass and mix with 8 or more ounces of water or other cool liquid. More water equals lighter flavor. Stir briskly and drink promptly. Take with meals up to 3 times daily. NOTICE: Mix this product with at least 8 oz (a full glass) of liquid. Taking without enough liquid may cause choking. Do not take if you have difficulty swallowing. Allergy alert: This product may cause allergic reactions in people sensitive to inhaled or ingested psyllium. Contact your doctor BEFORE USING this dietary supplement if you have recently experienced a sudden change in bowel habits persisting for 2 weeks, abdominal pain, nausea or vomiting. - Contains 100% psyllium fiber, which naturally works with your body to help you feel less hungry between meals* - Clinically proven to help control cravings between meals* - From the makers of Metamucil, the #1 doctor recommended brand - Directions of use (adults 12 years and over): Two rounded teaspoons in 8 or more ounces of liquid with meals, up to three times daily.